No wonder we hate people. When do we get to see the duckie hat? George looks lovely in that scarf and I like how it's colorful. Life's too short to blend into the wallpaper. Wow I love that scarf. Do you remember how many yards it took? 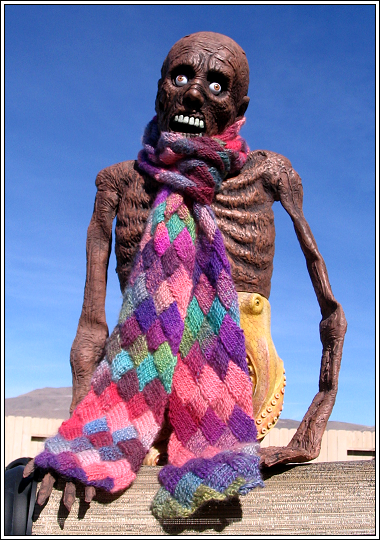 I like the idea of your skinnier scarf for some yarn my Cocoa pal sent me. Duckie! Need ... to ... see ... DUCKIE!!! Ok, where you at??? It's not like you to be THIS quiet. Ok, a month has gone by since I last asked, but WHERE YOU AT?? ?